The rain may have finally broke this afternoon, but the un-Florida-like chill is still here. And it’s just going to get worse. Wake-up temperatures started in the low 40s this morning, accompanied by icy rain. It snowed in Tallahassee and there are winter storm warnings throughout the northern parts of the state. The result? Icy roads as far south as Lake City, said 10Weather WTSP meteorologist Grant Gilmore. On Wednesday morning, the Florida Highway Patrol closed a portion of Interstate 10 from Tallahassee to Madison as freezing rain creates hazardous driving conditions. But despite clearing skies, the system is ushering in brisk northerly winds and a reinforcing blast of drier arctic air. The threat of bad weather prompted Lowry Park Zoo in Tampa to close Wednesday at 1 p.m., it announced on Twitter. It is expected to reopen Thursday at 9:30 a.m. Busch Gardens in Tampa planned to close at 6 p.m. on Wednesday due to the falling temperatures. Highs will reach the mid-50s, but gusts of up to 25-30 mph will produce feels-like temperatures in the low-to-mid 40s through the afternoon, Gilmore said. Swaths of state are under freeze watches and warnings, including parts of Hillsborough, Pasco and Hernando counties, where temperatures could drop between 28 and 32 degrees. Those gusts could result in high-wind advisories for the Sunshine Skyway Bridge. 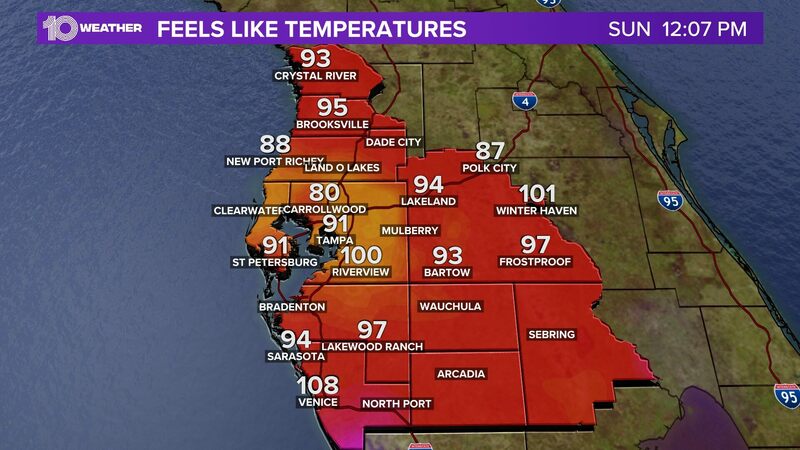 Temperatures on Wednesday night will fall into the mid-to-upper 30s — and at or below freezing in parts of northern Tampa Bay — with wind chills in the upper 20s heading into Thursday morning, Gilmore said. Expect highs in the mid 50s and lows in the low to mid 30s, through Friday, with slight warming on Saturday.